Invite the rich, crisp fragrances of winter into your home. •Winter Cabin: A warm, comforting blend of creamy chestnut, crisp cedar and pine, infused with cinnamon and spicy cloves. •Winter Wonderland: A sparkling blend of cool peppermint and fiery cinnamon with notes of crisp apple and creamy nutmeg. •Winter Night: Fir tree, warm Cyprus and clove bud blended with cedar and a touch of incense. •Spiced Apple Toddy: A warming blend of apple brandy and spiced plum, infused with mulled cider and tart cranberry. •Cranberry Cider: Bright fresh cranberries mulled in warm brandy and infused with cinnamon stick. 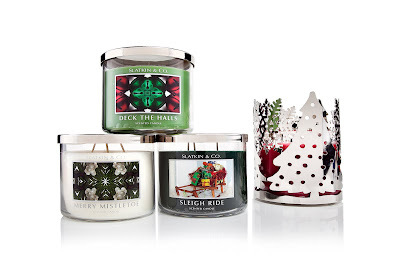 Classic holiday scents that will inspire the first kiss under the mistletoe. Decadent, mouthwatering scents that will satisfy the sweetest tooth season. •Dark Chocolate Mint: A luscious blend of dark chocolate shavings and pure peppermint, layered with rich vanilla cream and a touch of caramel. •Gingerbread: The perfect blend of spicy ginger, rich buttercream and brown sugar topped with whipped vanilla frosting. •Holiday Gumdrop: A bright blend of cinnamon stick and peppermint bark infused with vanilla and a touch of anise. •Candied Sugar Plum: Rich, sugared plums and boysenberries blended with sweet orange, cinnamon leaf and a touch of apple. •Marshmallow Peppermint: A delicious blend of sweet peppermint, fluffy marshmallow cream and rich vanilla cupcake. These yummy candles will be available at Bath & Body Work starting in October.. mm I like Marshmallow Peppermint!